Thierry Mugler has wowed us with his perfumes since 1992 and the appearance of Angel on the perfume scene made waves as an oriental gourmand (with hints of praline and chocolate) that smelt good enough to eat. I mean if it’s good enough for Eva Mendes, it is good enough for me! 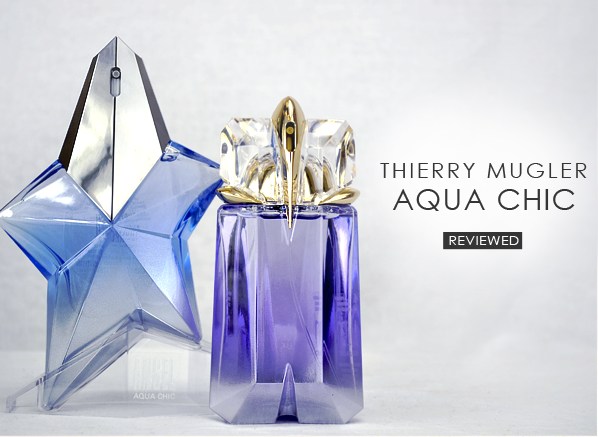 Due to the overwhelming popularity of Angel, Thierry Mugler often releases limited editions and this year is no different. Welcome the 2013 versions of Aqua Chic to the Mugler family! The signature notes remain the same (a beautiful sensual dry down of patchouli and vanilla), but the addition of rose and raspberry blossom and green apple granita reveal a fresher interpretation of this easily recognisable fragrance. I have to admit; I love Angel and have done for many years. I can never remember where I first smelt it but I must have been very young and it has stayed with me ever since. It is a perfume that can smell completely different depending on who is wearing it and on me; sometimes it’s just a little too heavy. However with the Angel Aqua Chic Eau de Toilette version of this I can spray it in the morning and it will still last a good 6-8 hours, without being overpowering, just a small movement and I will catch a whiff and it is beautiful. It is a lovely twist on a signature fragrance that suits my perfume needs down to the ground and comes in a beautiful star shaped flacon that has a slight frosting which looks beautiful on your dressing table. Angel may have made waves in 1992, but 2005 saw the birth of Thierry Mugler’s new fragrance, Alien. Inspired by a solar world full of hope, serenity and light, Mugler strove to create a scent that captured the seductress in us all. The original notes of Jasmine Sambac, Cashmerian Wood and White Amber have been modified to include orange and lemon blossom and pink grapefruit, which brings a certain freshness emanating from a woody and ambery base. Longevity is again great and lasts me most of the day but unfortunately it just doesn’t agree with my skin. With Angel it is dependent on what mood I’m in as to whether I find it too heavy, whereas with the Alien Aqua Chic doesn’t suit me. Never the less it is a beautiful Spring fragrance and yet again a beautifully designed flacon. If you’re a fan of the original Angel and Alien fragrances but fancy something a little lighter and cheekier, these limited edition fragrances are definitely worth a try! My wife commented how much she liked my sons girlfriends perfume and asked what it was. I overheard that it was Alien and bought her a bottle as a surprise, she was delighted. Everyone comments about the wonderful aroma. This entry was posted on Wednesday, February 20th, 2013 at 10:00 am and is filed under Fragrance, Guest bloggers, Tried & Tested. You can follow any responses to this entry through the RSS 2.0 feed. You can skip to the end and leave a response. Pinging is currently not allowed.